As this ingenious post over at Math With Bad Drawings explained so clearly recently, there is a big difference between finding the answer to a math problem and being able to explain, beyond all reasonable doubt, why your answer is correct. It is the difference between solving it and proving it! While mathematical proof is a huge part of math and science, it is unfortunately somewhat overlooked in the standard US curriculum. Partly for this reason, my family and I started a new math summer camp called Prove it! Math Academy. This year’s program will be a two-week crash course in proofs, using challenging problems and advanced mathematical concepts as examples. No explanation, no words, no proof. Just the picture. Enticing! The first step in proving a fact is to state exactly what it is you are trying to prove. In this case, one might generalize/interpret this diagram as follows. Suppose you have a circle $O$ (the big white one) containing three circles $A$, $B$, and $C$ inside of it that are mutually externally tangent to each other and internally tangent to $O$. 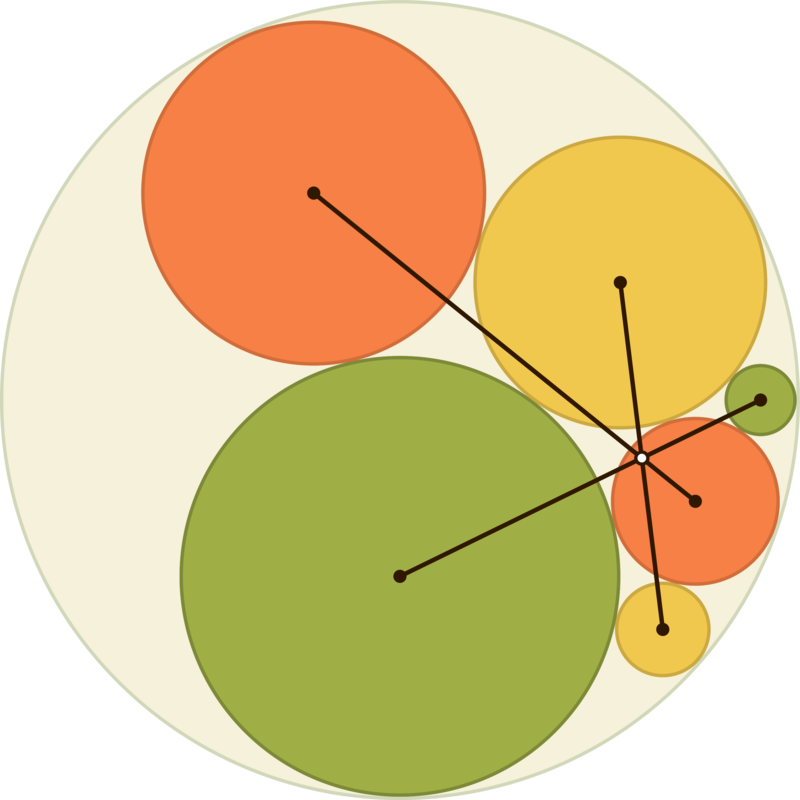 (These three circles $A$, $B$, and $C$ would be the large green, large yellow, and small red circle in the diagram above.) Now let $X$, $Y$, and $Z$ be the remaining green, yellow, and red circles respectively: for instance, $X$ is the circle tangent internally to $O$ and externally to $B$ and $C$. Then the lines $AX$, $BY$, and $CZ$ connecting the centers of these circles all meet at one point – they are concurrent. You can construct this in Geogebra or Asymptote. You can vary the sizes of the circles and test that indeed, these lines always seem to be concurrent. But unlike in science, lots of evidence to support a fact is not good enough in mathematics. We want to prove beyond all reasonable doubt that this is always true, no matter what the sizes of the circles are. In other words, you can solve it, but can you prove it? A very elegant solution to this problem, which appears on the next page of this post, is due to Michael Kural, one of my former students at MOP. He was intrigued by the image on our program flyer at a recent math tournament, and came up with a proof using only Desargues’ theorem, Monge’s theorem, homothety, and inversion. Read on! This entry was posted in Gemstones, Pearl by Maria Gillespie. Bookmark the permalink.